Oh my goodness, the silver train looks fantastic! These are the cutest, I love them. The silver one is absolutely brilliant, I wish they'd have gone with two of them, but the blue is cute? Hutch, CrashCoaster and Matt N like this. EthanCoaster, Hutch, GuyWithAStick and 4 others like this. Matt N, Pear, EthanCoaster and 1 other person like this. That turn-around looks way to tall for the rest of the layout. EDIT:- Do I spy a triple down? Matt N, Pear and Peet like this. sirloin, Pear, Hyde and 3 others like this. I must say, this might be the new-for-2019 cred I'm most excited for. You know these rides are fun. Pear, Niles and Matt N like this. Do we know if this is gonna be open on opening weekend. I plan on doing a Cred whore trip there in April. I'd assume not? The way they've been talking about it is 'Summer', so I'd assume maybe end of May? 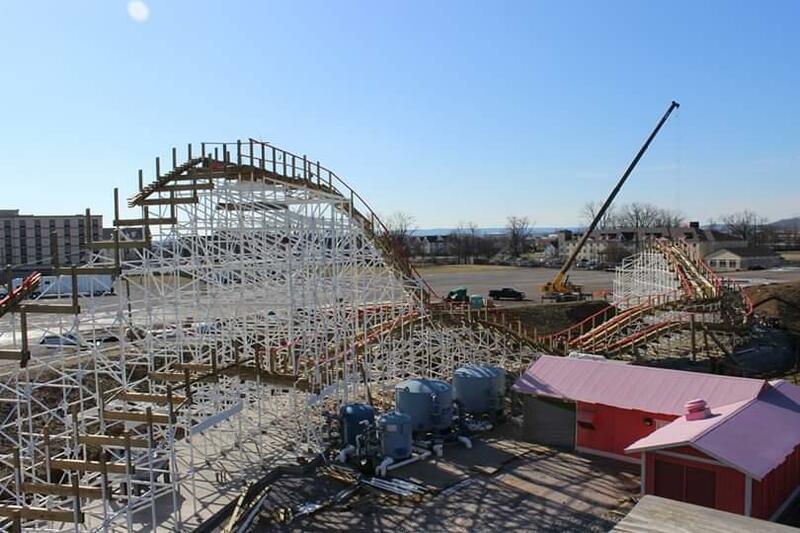 The ride looks to be almost complete, besides missing the top layer of track. Looks like fun! Matt N, Pear and Hutch like this. That classic boardwalk woodie colour scheme gives me life. I want one. tomahawk and CrashCoaster like this.